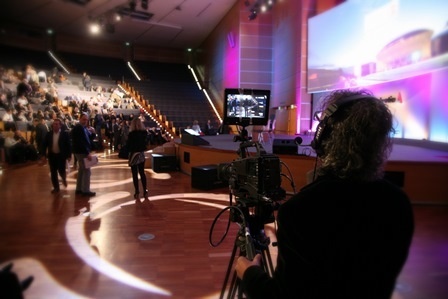 The Palacongressi di Rimini features avant-garde technologies and was designed as a single set-up of systems and control rooms, able to meet all the needs of the conference participants. All the conference technology is installed in the rooms following a criterion that gives priority above all to flexible use and configuration that can be rapidly customized according to specific event requirements. The rooms are equipped with: speaker rostrum and head table with monitors, PCs and microphones, wireless microphones, motorized screens, IR simultaneous translation systems, fibre optic network (audio, video, internet e telephone), professional motorized video cameras, teleconference systems, high-power video projectors, audio, video and lighting control rooms, Wi-Fi Web access, HDSL lines, dimmable lighting on platforms, flying points for additional hardware in the main rooms. 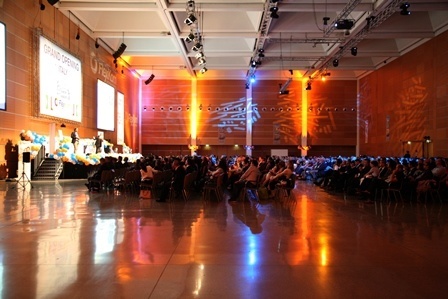 And many others innovative solutions will be suggested by the professional team of the Palacongressi close to the event organisers to guarantee the success of the event.